A man who stabbed the mother of his children in the neck after she called off their wedding has been convicted of attempted murder. Steven McKee was found guilty by a majority verdict of trying to kill his ex-fiancee at their home in Slamannan, Falkirk, on 24 July last year. Lisa Whyte, 32, fled to a neighbour's house after the attack with the blade still sticking out of her neck. Father-of-two McKee, 38, will be sentenced next month. A jury found him guilty of attempted murder following a week-long trial at the High Court in Glasgow. It emerged after the verdict that McKee already has four previous assault convictions stretching back to 1991. During the trial, jurors heard the self-employed glazier was left devastated and angry when Ms Whyte called off their wedding after her hen night in Newcastle, a week before the ceremony was due to take place. They had been due to marry at Falkirk Registry Office and had planned to go away with their children to Turkey. McKee - who cut up their passports in front of their two young girls - later took an overdose of painkillers and spent a brief stay in hospital. The pair agreed to meet at their family home the day after they were due to get married, the trial heard. But after Ms Whyte reiterated that there was to be no reconciliation, McKee told her: "Well, if I cannot have you, nobody will have you". 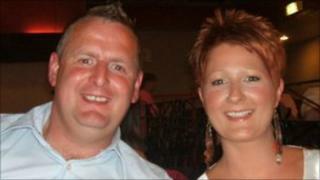 Jurors were told that McKee then attacked her with two knives, before plunging a third into her neck. McKee said in his defence that he was trying to kill himself and Ms Whyte had got in the way - a claim prosecutors branded as "ridiculous". With the knife sticking out of her neck, Ms Whyte subsequently tried to get help from a neighbour who described her as looking as if she had been "dipped head first in blood". In a statement, Ms Whyte said her family had been "devastated by this horrendous ordeal" and were relieved that justice had been done. She added: "I would like to thank all the medical professionals for saving my life. I would also like to thank my friends and family for their continued support, and my thanks to the Crown Office and Procurator Fiscal Service. "Under the circumstances I would like to try and put this horrendous ordeal behind me and concentrate on my children and therefore would appreciate my privacy."